I just came across video documentation of a new public performance by Alex Villar – “Breaking into Business” that he executed as part of the Open City festival in Lublin, Poland. In “Breaking into Business”, he literally performs the concept of “Open City” by walking through the city pushing a scaffold on casters, setting the scaffold below a business window, climbing up the scaffold and into a window. As I watched the video, I kept wondering if all these places had agreed to his visit or what was the reaction within the location as Alex stepped into the building from a second or third story window. Unfortunately, the videographer only follows Villar on the street and we never see the interaction within the building. As is the nature of Alex Villar’s performative work, the focus is on his action, movement and intervention in and through the urban space. 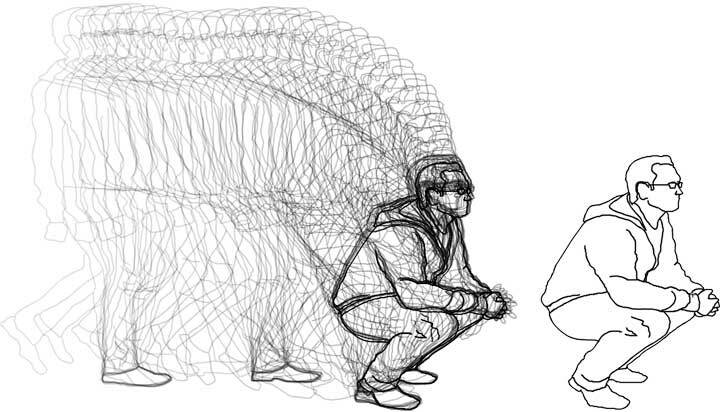 Rotoscoping is a sequence of traced drawings to create an animated version of live footage. Rotoscoping, one of the oldest techniques for animation, is the tracing of live-action footage, frame by frame, to create an animated version of the movement that may later be modified to create a fantastic short. Participants will be shown basics of video editing, using Apple’s Final Cut Pro, and introduced to Adobe Flash, the software used for animation and basic drawing. In order to rotoscope, the still images from the videos will be exported from Fincal Cut and brought into Adobe Flash for tracing. Participants can elect to creatively modify or transform the recorded motion rather than strictly follow it. One of the earliest examples of rotoscoping is Max Fleischer’s, “Out of the Inkwell”. “What Are You?” by Daniel Salgado, Untitled by Ryan Cruz, Untitled by Mica Tan. 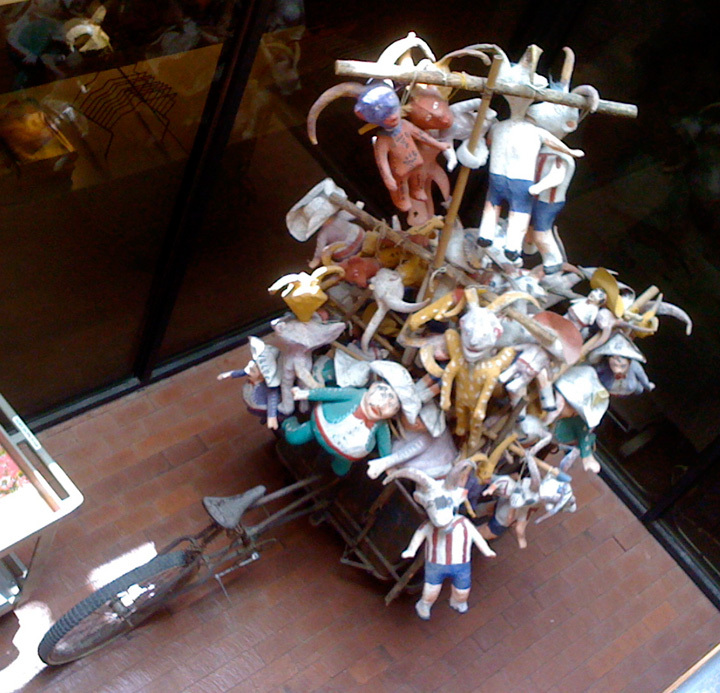 The Muñoz Waxman Gallery of the Santa Fe Center for Contemporary Arts currently houses a giant child’s dream. 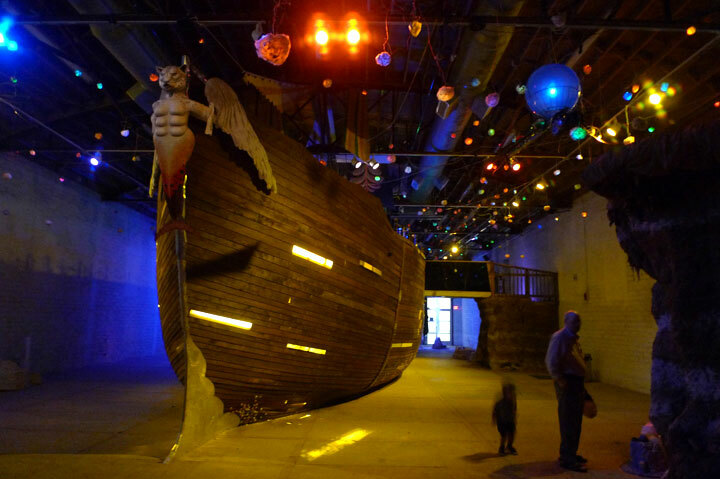 Once you walk past the reception desk, imagine walking into a cave and as you come out the other side, you discover a huge sail boat anchored in the main space. My wife took our nearly three year old son to the installation last week and he went nuts. I didn’t get to see it, so I decided to take him back today, it was a lot of fun – a rich imaginative space for young children and just cool for everyone else. 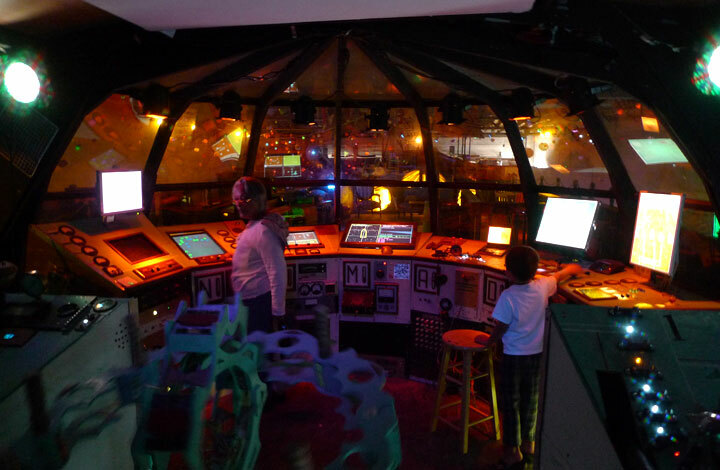 Once we were on the deck, my son headed straight to the navigational bridge which is filled with monitors, buttons, switches, leds… The monitor’s present Processing sketches that allow for interaction via a variety of switches. 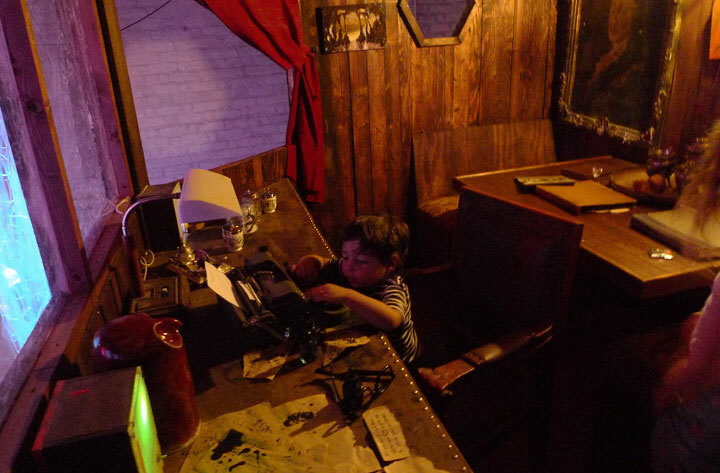 Two slightly older kids, perhaps 4, 5 or 6 were already at the helm and navigating the ship into a battle. Iggy jumped right in, though he immediately started calling himself the captain. Close up of main monitor in the Bridge, a fun Processing sketch. 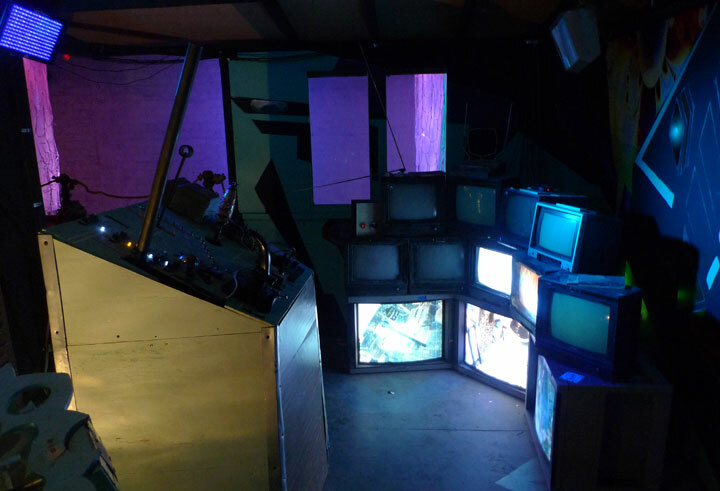 At the back of the bridge, there are stacked televisions with single channel camera feeds, so that you have a view of other parts of the ship. Security Monitors on THE DUE RETURN, as in most of the ship, some things function others adorn. A couple swinging doors behind the bridge lead to the Captain’s private quarters, where you’ll find his bed and a small dinning table and a work desk. 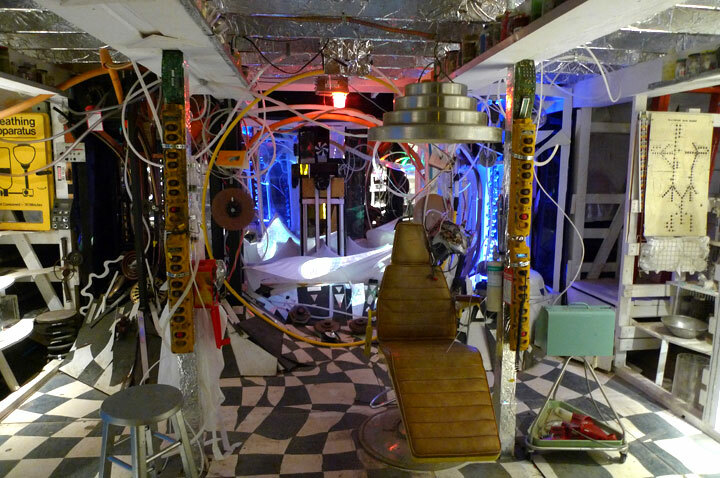 Immediately below the deck is this room, I’m not sure what to call it… the first aid area or the torture chamber… at the center is an old dentist chair with abstract projections behind it. 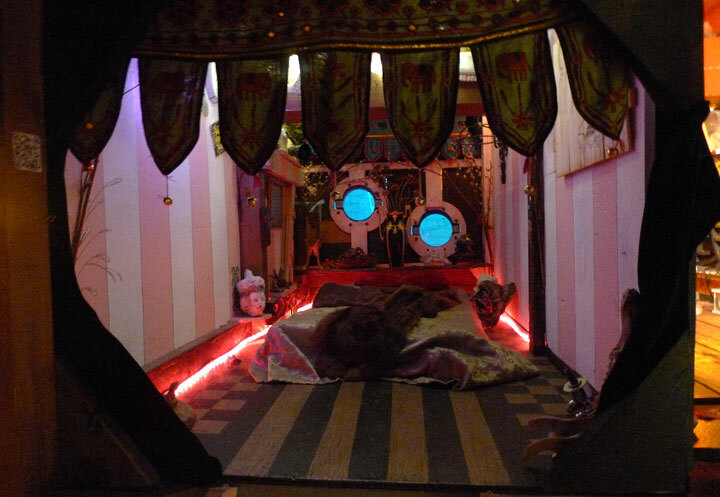 Beyond the clinic and below the main deck are several sleeping quarters. They are small stacked crawl chambers and all differently decorated with private belongings of crew members. Each crawl space presents plenty of material to investigate and play with. Single sleeping chamber, stacked above another sleeping chamber. 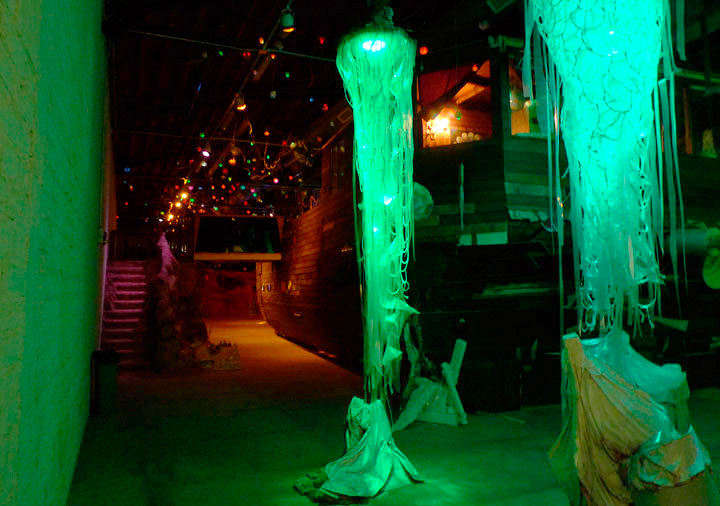 Behind the ship, it leaves some floating, glowing material. As well as several other sculptural elements not pictured. Behind the ship as it escapes some floating glow things. 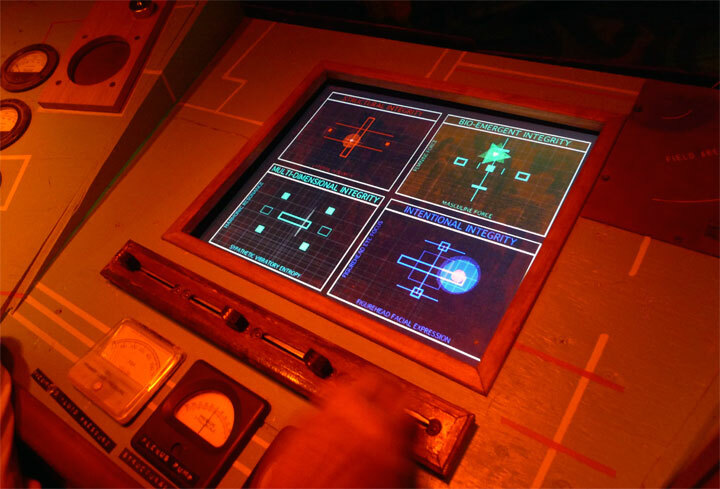 Throughout the ship you can find 2D barcodes that lead you to webpages that tell the story of the ship and it’s crew. You can learn more about it at THE DUE RETURN’S web site and apparently there’s a link to a related iPhone app… every media available is part of this ship! 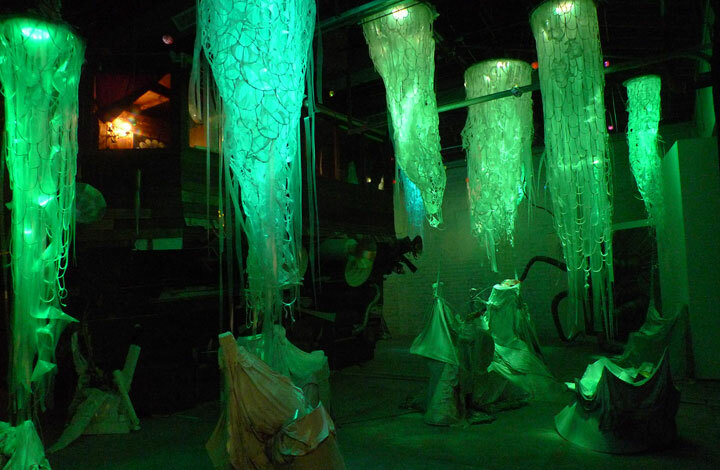 It was also a performance space from end of May through June. But ultimately, it’s a child’s dream come true. I couldn’t get close to this bicycle, so I shot it from above. Since the Chivas mascot is prominent amongst the paper mache figures, it’s safe to assume that it’s a Mexican shop on wheels, beautiful! I failed to write down where this head piece is from, I believe either Bolivia or Peru. A video next to a few of these featured the man who makes them from discarded objects. 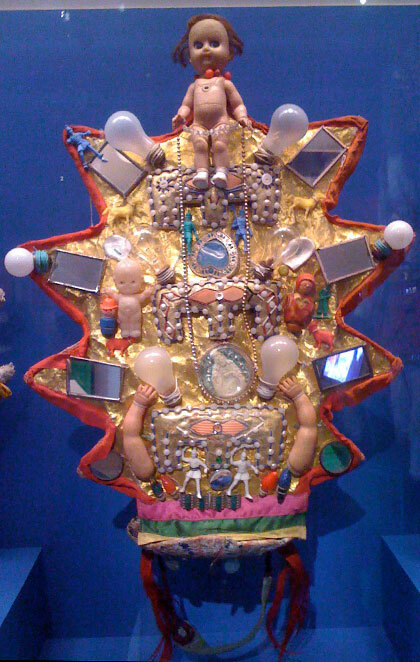 During a festival, men wear these things on their heads, there’s an entire armature within it that the performers need to hold, so that the piece stays in place. Documentary film maker and colleague Kelly Anderson has just launched a kickstarter campaign for a doc in production titled “My Brooklyn” revolving around urban planning and gentrification in Brooklyn, particularly changes occurring in and around Fulton Mall. Check out the trailer and support the film if you like what you see!